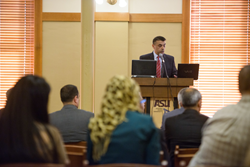 Palestinian and Arizonan representatives spanned the geographic gap and met at Arizona State University in Tempe to learn from each other’s struggles and successes. During this workshop, the Renewable Energy Leadership Training Program, attendees worked on a roadmap toward a sustainable and independent energy system. Dr. Omar Kittaneh, chairman of Palestine Energy Agency, addresses the similarities between Arizona and Palestinian energy struggles and needs. While thousands of miles apart, Arizona and Palestine must respond to similar energy challenges when faced with transmission, funding and technology issues. From March 24-28, representatives from both regions spanned the geographic gap and met at Arizona State University in Tempe to learn from each other’s struggles and successes. During this workshop, the Renewable Energy Leadership Training Program, attendees worked on a roadmap toward a sustainable and independent energy system. This workshop is the second of two training programs that have stemmed from a partnership between ASU and An-Najah National University in the West Bank. Participants in the workshop toured local facilities in the valley, including First Solar, the ASU Solar Power Lab, TÜV Rheinland and the Arizona Center for Algae Technology and Innovation on the ASU Polytechnic campus. Following the Renewable Energy Leadership Training Program, the participants from Palestine will seek to implement renewable energy projects they have formed as a result of their training. The benefit of the workshop was mutual, as ASU also was able to gain valuable insight into the program and Arizona’s energy policies and practices. The university plans to expand the program globally in order to continue to support ongoing energy transformation in developing nations and within the U.S. The Renewable Energy Leadership Training Program is possible thanks to Arizona State University and the Office of Ambassador Maen Areikat. The program received support from the Palestinian Energy Authority and ASU Global. Additional support was provided by LightWorks, an ASU initiative that unites resources and researchers across ASU to confront global energy challenges. To learn more about the Renewable Energy Leadership Training Program, visit najah.edu/ren-leaders/about.